I've never hidden the fact on this blog that I am pretty oblivious when it comes to a lot of things and up until about three years ago, I was oblivious to the existence of the product that today's review is modeled after. 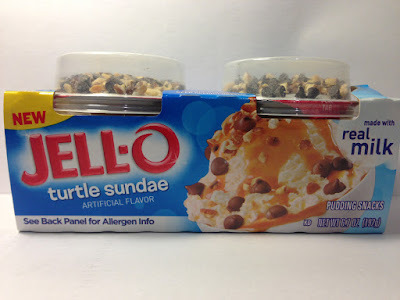 Today, I'm adding to my JELL-O Mix-Ins collection with this review of the JELL-O Mix-Ins Turtle Sundae Pudding that I picked up at Meijer in a two-pack on sale for $1.25. The reason I mentioned my proclivity toward obliviousness is that for the overwhelming majority of my life, I had never heard of a Turtle Sundae. Yep, that's right, I had never heard of one of the most classic ice cream sundaes until I was thirty. As always, I'm a rube. Anyway, each one of these pudding cups is roughly 3.4 ounces and is 150 calories per cup. When I took the lid off of this, I was surprised to see an old friend. 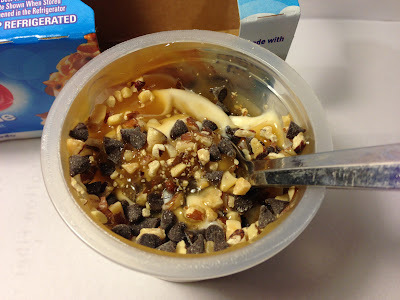 Yep, JELL-O has re-purposed it's Dulce de Leche pudding (which I've reviewed) and used the same pudding for this Turtle Sundae pudding cup. The pudding itself is the vanilla "custard" pudding on the bottom and then the caramel topping on the top. It looked the same, smelled the same and using my strong powers of deduction, I've concluded this is the same with only one difference...this one has sugar and is not sugar free like the one that I reviewed. The mix-ins container than includes shards of almonds, pecans and tiny little chocolate chips. Outside of that, there's nothing else going on. One thing of note is that for the first time in one of these Mix-Ins reviews, there was not an overabundance of mix-ins that caused the cup to nearly overflow. Mixed together though, you get what I've pictured above. I won't spend a lot of time reviewing the taste of the re-purposed pudding since I've reviewed it before other than to say that it was delicious as I expected. The mix-ins themselves pretty much tasted as you'd expect them too ad add some different crunch and textural mouthfeel to each spoonful. One thing I will note is that the chocolate chips had strong chocolate flavor and melted in your mouth, almost like a chocolate syrup, so that was kind of fun.